I’ve been meaning to get a proper bike rack for a while. I’d tried a few of ways of attaching the bike to the car and most would involve regular resprays. The £25 I spent was far less than expected and this trip was the fantastic first foray into what my brain already calls “bike and hikes”, a phrase the rest of me feels a bit embarrassed by…. The idea was akin to my time kayaking at uni. We’d take the minibus packed with gear, and on top of our boats and paddles we’d attach a bike so that someone could cycle back upstream and get the bus. Why we didn’t take a car I’m unclear about now, my memory being all the poorer after a lifetime writing lists. But the bike was part of the adventure and I felt that access to a bike now would allow me to reach remote hills and areas more quickly and mean some of my walking trips could be more linear. I love a circuit, to avoid walking to a particular point and back, the back being the bit that for me can be a bit dispiriting on a day out. I’ve never particularly enjoyed the walk back as much as the powering ever onward, and this trip demonstrated the power of always moving forward. The East Highland Way has interested me on and off for years and particularly the section between Laggan and Newtonmore. The bike made this simple. Park at Newtonmore, pedal to Laggan, and walk back to the car, a 13km cycle along the A86 followed by a 15km walk via Strath an Eilich, Dalnashallag bothy and Glen Banchor. The old bridge up the track to Strath an Eilich from Balgowan. Yes I crossed it. No it didn’t break. Looking down Strath an Eilich towards the Monadh Liath. The view back down Strath an Eilich from Dalnashallag bothy. Looking back at Dalnashallag bothy from Glen Banchor. A ruined cottage at Dalballoch in Glen Banchor, looking back towards the bothy. The warm weather and sunshine was amazing and the autumn colours on show were brighter and more natural than any Instagram filter could provide. I’ve now got my eye on completing the EHW over the next few months. The bike rack will definitely help. As will the bike. And always forward. I don’t fancy cycling backwards. Check out the film. I have a dream. To live in an old cottage far away from civilisation. And every now and then I travel over Dava Moor (between Nairn and Grantown on Spey) and I can see the remains of what must have been a well populated area in days gone by. Old and derelict cottages, tracks and bridges can be seen in amongst the heather and peat of the moor. A holiday in Carrbridge presented itself as a great opportunity to take a closer look. An early start meant I caught the sun rising over the moor and some of the abandoned buildings. My route around the cottages at Easter Crannich, Wester Crannich, Anaboard and Rychorrach totalled about 7km and the warm air and lack of breeze were really noticeable, even at 5am. A breakfast of wild raspberries was pretty tasty and more refreshing than the nutrigrain bars I’d packed. Anaboard Cottage – The fireplace gives an idea of when the lintel was put in. Wester Crannich Cottage – The most ruined of the four buildings with no roof or internal fittings but lovely stonework. The last two cottages were the most interesting. Quite snazzy if you like your history. Easter Crannich Cottage – Very steep steps and horrendous contemporary wallpaper downstairs. But upstairs I found a wall plastered in old newspaper, the newspaper in question being The Illustrated Sporting and Dramatic News. Not one you’ll see in the stands today as the last day of publication was in 1970. And it reported on just what the title suggests, sports and theatre. I’m assuming the newspaper was used as an insulator, as I imagine winters in Dava would be pretty chilly. The date on the paper was pretty interesting, Saturday 25th March 1905. 1905!!!!…. Rychorrach Cottage – A beautiful setting higher up with views for miles, including the Cairngorms. The occupants of this house had followed the lead of the Easter Crannich residents and put extra insulation on the wall, but had taken the idea a step further, thicker cardboard boxes this time instead of newsprint. They were tacked to the walls incredibly neatly and looked almost artistic as the collage of brands wouldn’t look out of place in a gallery. Corn Flakes, Vim and Scott’s Oats, which are still going strong today. Others I’d never heard of such as Smedley’s carrots and Oxydol washing powder. The most interesting box was one labelled dried eggs and “For European Recovery” and was part of the post-WW2 Marshall Plan to revitalise Western Europe. A fascinating discovery and quite something to see the item in real life and how it was used after. I found a calendar at the house from the year 1950. And after a bit of research I think the last occupier was a man called James McDonald. Maybe he was the decorator but I can’t be certain, there isn’t much online about Rychorrach to be sure. Would I live there? Probably. 21st century heating is a wonderful thing. At McGregor’s Cave near Kinloch Rannoch of course. 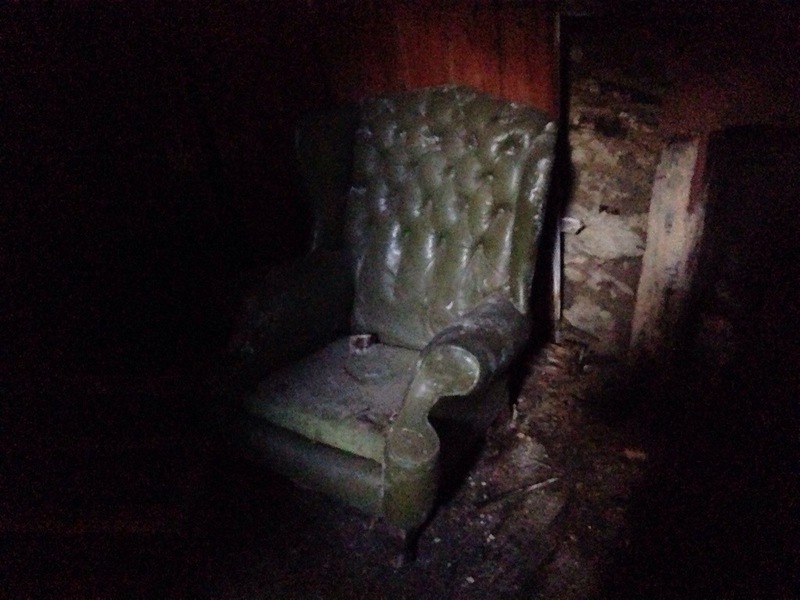 While walking the West Highland Way last week, I managed to find some urbex action. Even with sore legs, I resisted the urge to sit on this old chair. Inside the Mintlaw cottage, a TV Jim, but not as we know them. Apologies for the fuzziness…. Can anyone see my house…..? An abandoned cottage near Mintlaw. Despite the Ivy barricades, managed to get inside to have a wee look. The ivy is taking hold inside too, I’ve had my eyes opened to the power of this little plant. Another from Strichen House, filled with walls and trees that seem to be trying to strangle the life out of the building. It’s Playschool! What can you see through the…..triangle window? Strichen House, as seen from the Doocot nearby. Took a pile of other pictures, will put up one or two others. Our latest trip. We’d heard about an abandoned farm near Cove that was surrounded by new houses so we packed our cameras and went to see for ourselves. It was a big set of buildings to look around and a lot of the farming bits and bobs are still there. The house left us with a bit of a sad feeling as loads of personal effects were still in the house. Loads of pictures, medicines and little reminders of the people that used to live there. And a lot of mindless destruction. It was like they had just up and left. Or something much sadder.